Chorizo Stew with Saffron Mash | Simple. Tasty. Good. Gosh I could easily have eaten another plateful of this combo until I would have burst! The chorizo sausages I bought at my local farmers market are nicely fatty and quite coarse in texture. The perfect sausages to add to a stew then! It gives a tremendous flavor boost to the tomato sauce because of all that oily fatty stuff inside. Yum. Just absolutely yum. No need to wait for cold winter nights to serve this one anymore then because no matter what season we’re in, this stew tastes downright fantastic. A comfy stew with some sunny flavors… this chorizo stew with olives and tomato sauce is a perfect match for the creamy saffron mash then! Love saffron? Then also check out my homemade ossobuco with saffron risotto! 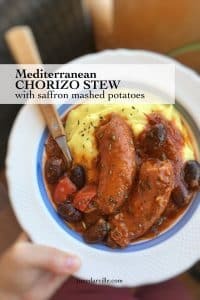 A comfy stew with chorizo, olives and tomatoes over creamy saffron mash! Add the chopped garlic (keep a tablespoon aside for the mash) and onion to a large and high pan. 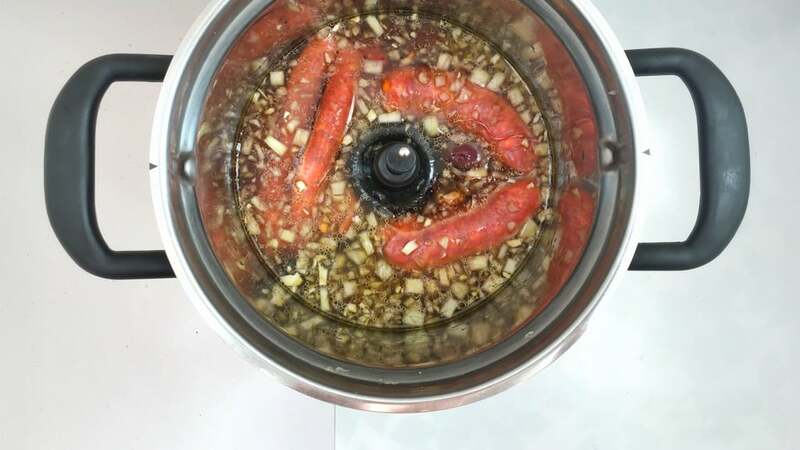 Add the sausages, black olives and olive oil. Then chop the tomatoes roughly and add them to the pan also. Pour in the beef stock and season with a good dash of pepper and a pinch of salt. Put a lid on the pan and place it over high heat until boiling. Then turn the heat lower to medium and cook the stew for an hour until smooth. Check regularly. Add extra beef stock or water if necessary. In the meantime peel the potatoes and chop them up. Add the remaining garlic. Boil or steam the potatoes for 20 minutes until tender. Drain the potatoes if you cooked them. 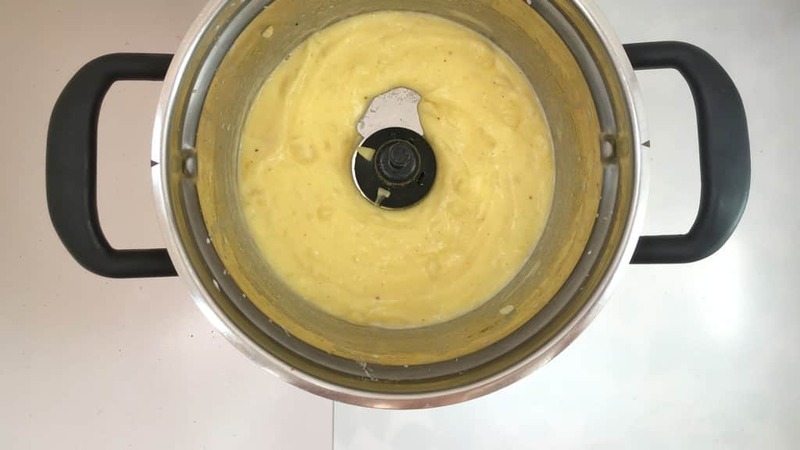 Then add the (steamed) potatoes and saffron powder, milk or cream, butter and a pinch of pepper and salt to a large saucepan. Mash the potatoes until creamy. Add extra milk or cream if necessary. Then let the mash rest because the saffron flavor has to develop. Check the seasoning of the stew and add extra pepper or salt to taste if necessary. Scoop the saffron mash onto deep plates and then top with the sausages and the tomato sauce. Serve hot. Well this is I think the first whole meal I have made in my KitchenAid Cook Processor then! Here’s a delicious chorizo stew with tomatoes and olives served over a gorgeous dollop of creamy saffron mash. Why saffron mash? Because this stew is a perfect match for it! I’m using 2 different programs here: Stew to prepare the… well yeah the stew. 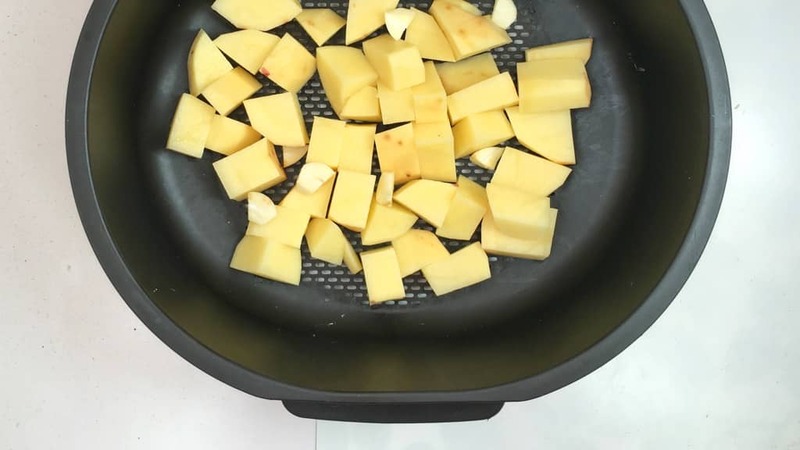 And Steam to cook the potatoes until tender. Easy peasy. You can prepare the stew in advance if you like. Make sure you let the potato mash rest a little in the end so that the saffron powder can fully develop. Add the onion and 2 garlic cloves to the bowl of the Cook Processor fitted with the MultiBlade. Close and press Pulse for 10 seconds. Then add the sausages, black olives, olive oil and tomatoes. Also add the beef stock. Season with pepper and salt. Then close the lid and select STEW P2. Press Start. In the end press exit. Check the seasoning. Add extra pepper or salt to taste. Transfer the stew to a pan. Then rinse the bowl of the Cook Processor. 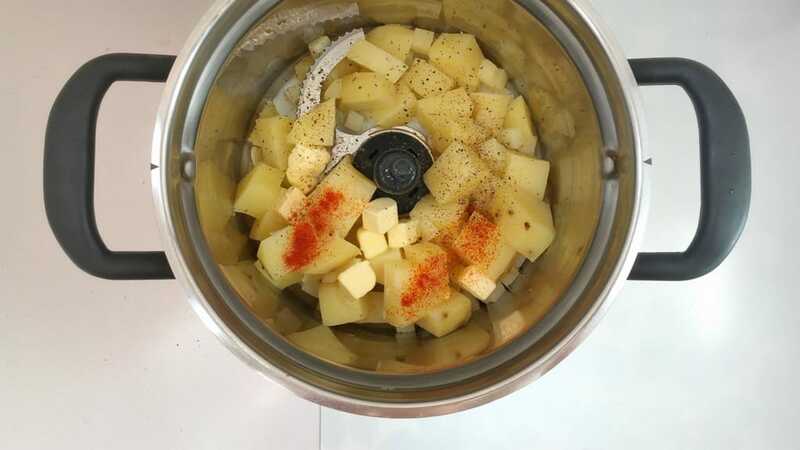 Add the chopped potatoes and remaining garlic clove to the Cook Processor steamer basket. Cover with the lid. Fill the bowl of the Cook Processor with 2 cups (480 ml) of water. Place the steamer basket on top. Select STEAM P1 and adjust the cooking time to 20 minutes (instead of 10 minutes). Then press Start. In the end press exit to cancel the keep warm mode. Discard the water and add the MultiBlade to the bowl. Add the steamed potatoes and garlic, saffron powder, milk or cream, butter and pepper and salt. Press Pulse for 5 seconds until the potatoes are smooth. Check the seasoning and add extra pepper or salt. Let the mash rest because the saffron flavor has to develop. Then pulse the mash for another 5 seconds. 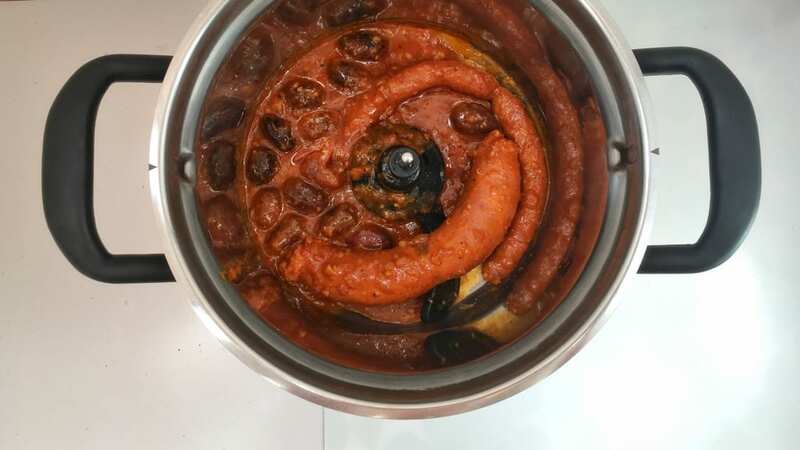 Reheat the sausage stew. Scoop the saffron mash onto plates and then top with the sausage stew. Serve hot. So because I am living in Spain, it’s fairly obvious I think to see why I love to cook with Spanish chorizo! These sausages are made from coarsely chopped pork and pork fat that has been seasoned with lots of salt and pimentón or smoked Spanish paprika powder then. Because pimentón can be both mild and spicy, depending on what type of paprika is used, chorizo can either be spicy or sweet. 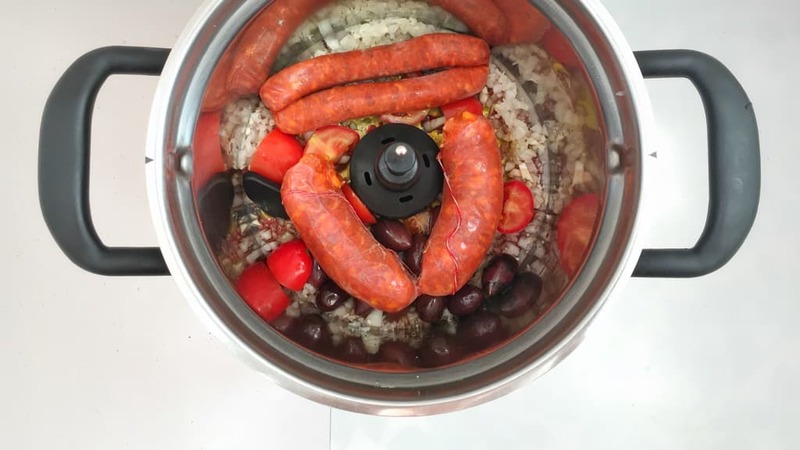 Not surprisingly Spanish chorizo comes in lots of regional varieties because locals just add whatever ingredients are available in the region. Other ingredients such as herbs or onion may also be added. Don’t you just love sausages!